"Walking through puddles is my favorite metaphor for life." Wow! 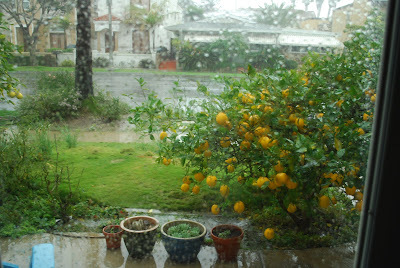 Love the window scene with the lemon tree in the background...it's been pouring here too. Luckily I've managed to avoid any horrific traffic nightmares...so far! Great photos ... and at least its not snowing! Oh my, the car photos! I hope no one was hurt. This is near you? But again-the lemon tree. I LOVE it! I've never seen a real one. And I adore the way your pictures show the tree getting more and more obscured by the rain!! Just wonderful! I hope you will continue to stay safe in all the storms coming your way. Your 'Chaos' mosaic did a good job of showing the problems out there. I did like your photos through the window. Raining loads here too in the bay area. I am a Londoner so should be used to it, but this is strange. My friend had an accident when her car slipped and spun, it scared her but only slight damage to the car thankfully. 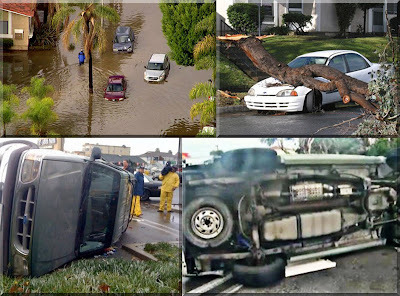 Your sky, rain and lemon photos are gorgeous and the car mosaic reminds us all to take extra care while driving in these conditions. It's a long time since I splashed in the puddles lol. Kathy. I'm glad for the rain but not for the destrucion caused by having it all come at once. Great shots to show the weather. Great shots of the rain! I saw some pictures of it on the news here this morning. I almost think I prefer the snow to the rain. 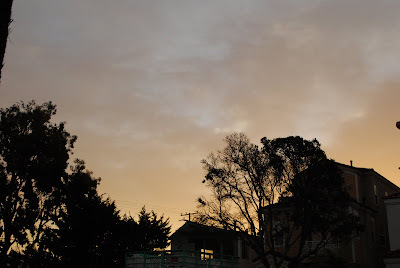 Beautiful rainy day shots. 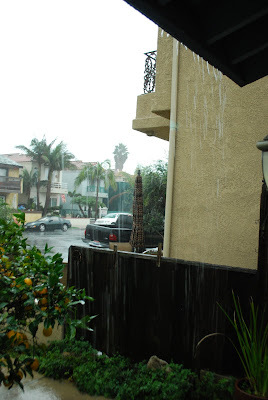 I actually love rain after a 2007/2008 drought forever changed my idea of a beautiful day. I've come to see rainy days as beautiful days although sometimes it gets to be too much. You captured the beauty of rain. Oh how terrible!!! I keep seeing reports and seeing the flooding out there. Hope you are okay. Please stay safe. Beautiful poem, my friend. Your photos are gorgeous, too. Very nice. Thanks for sharing with us. 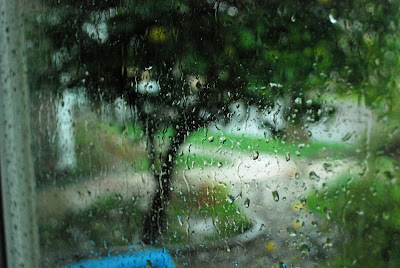 Your rain shots through the window are absolutely amazing. Rain, rain go away come back some other day. Are those oranges? Wow. We're still a frozen tundra here in MN. If it weren't for the fir trees and the recycling bins, there'd be no green at all. S.T, your poem is wonderful! 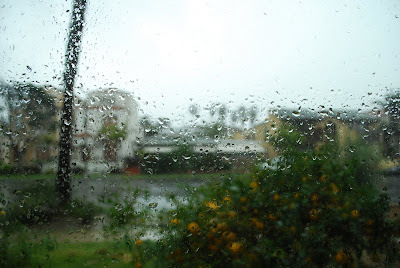 Your pictures are great too, they remind me a lot of our South Texas on a rainy day. We have a lot of those. 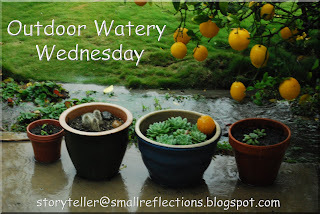 I did a MidWeek Blues tonight on my Jim's Little Blog. 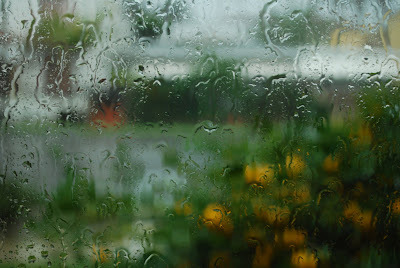 lovely photos of the rain from your window. Wow is the weather dramatic in California! I hope there's no more damage! But I do have to say--oh how I wish I could come over to your house with a basket, and pick some of those delicious looking lemons!! A winter rain. Beautiful photos! Gee, the flooding is awful there, I hope you stay safe. Great photos. I thought that I heard something about a tornado in your area. And, we're having earthquakes in OK! Fantastic shots !! Nice post !! These photos are amazing. I love the lemon tree in the blurry window. I hope no one was hurt in that accident. Terrific photos. What a time you all have had. Stay safe. That rain looks even heavier than what we had yesterday! I don't blame you for staying indoors! And I agree about the lemon tree photo! rain rain gooooo away, they've had too much in so cal....we need it here in Hawaii - its a drought, not a drop in over two weeks! Wow! The rain has done it to some areas. I am happy to have some sunshine today in CA!